What is the Sand-Rich system? Are you looking for a deck resurfacing system that is versatile and multi-purpose? Sand-Rich is a liquid applied deck resurfacing system that can adhere to just about any substrate. It is multi-layered, flexible, tough, waterproof and decorative. It is ideal for use on almost any surface in a construction project including flat roofs, terrace, plywood, floor tile, concrete floors and pool decks. The Sand-Rich system does what other systems cannot do. This system is supple. This enables it to conform to the deck surface. It also moves with the surface on which it has been applied, thereby preventing cracks. 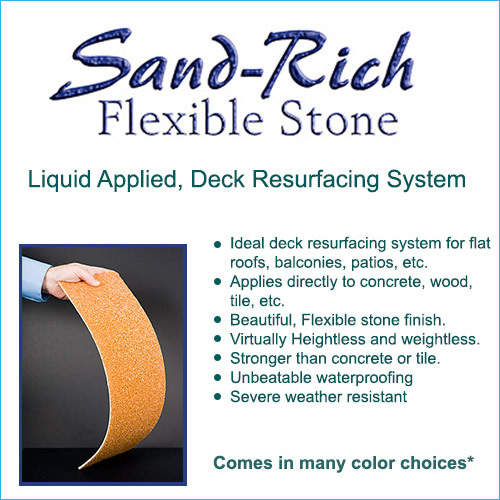 Sand-Rich offers a permanent solution that is easy to maintain. When used on a roofing application, you will never have to apply another roof again. Is fully waterproof. The Sand-Rich system when combined with PerfectMembrane is fully waterproof. Will not create door-swing problems when applied. The system is virtually height-less. Will adhere fully and therefore prevent the entrapment of moisture. This ensures that you don’t have to deal with moisture problems such as mold infestations. Will stop destructive leaks. The Sand-Rich system forms a protective layer that is waterproof and attractive over the deck. Fully encapsulates the surface. The Sand-Rich system completely seals away the deck ensuring that asbestos and other toxic products don’t seep through. The system helps to protect the surface from wear and tear. It also improves fireproofing and helps to save energy. Search through every product available in the US today. You won’t find a system that provides the same features. Is ideal for resurfacing tile deck systems that have failed. Is environmentally friendly. It is therefore ideal for those who want to fulfill their responsibility to the environment and prevent dumping of hazardous waste to landfills. Is extremely lightweight and virtually height-less. Features European technology that has been proven over 30 years. The Sand-Rich system is tough, hydrophobic and flexible. It is VOC free and adheres to a wide variety of substrates, making it versatile. Ideal Deck Resurfacing System for Flat Roofs, Balconies, Patios, Etc. Applies Directly to Concrete, Wood, Tile, Etc. Beautiful, Flexible Stone Finish Virtually Height Less and Weightless. Stronger Than Concrete or Tile.